Sebastian Vettel has defended the use of team orders from Ferrari which wrecked the race for his team-mate Charles Leclerc. The youngster passed his more experienced team-mate at the start but soon came under pressure from Vettel as the Mercedes pulled away ahead. Ferrari ordered Leclerc to allow Vettel through, and despite obeying the orders, the four-time World Champion suffered a scruffy first stint and was unable to take advantage of the clean air. The team would leave Leclerc out for several laps after his team-mate had pitted, causing him to drop to P5, where he would stay despite their efforts to give him fresh tyres in his final stint for an attack on Max Verstappen. 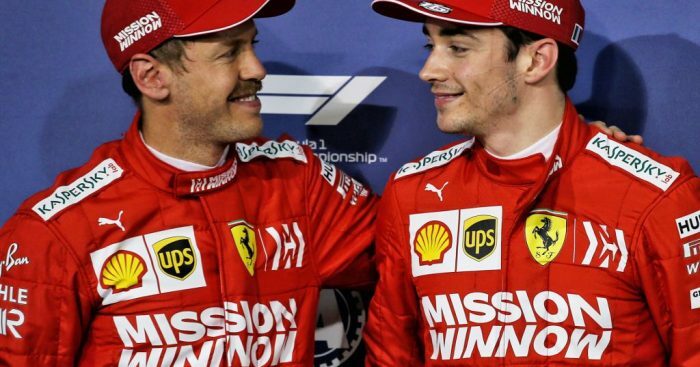 Vettel though believes he was faster than Leclerc throughout the race, and so agreed with the Scuderia’s decision to swap them around. “I felt I could go faster than Charles, it was difficult for me to find a rhythm so I locked up and lost the advantage again, and I think it’s fair if you see the whole race – we just weren’t able to catch Mercedes,” he told reporters in Shanghai. Mercedes comfortably beat the Ferrari pair for pace, something which Vettel had no counter for. “I’m happy to be on the podium but it was tough to stick with Mercedes from the start,” he said. Red Bull attempted the undercut on Ferrari at the end of their first stint, and while Verstappen comfortably cleared Leclerc, a few laps previous he went wheel-to-wheel with Vettel, the German would ultimately push him wide in the run up to the final turn and hold on to the position. “I saw Max coming and the speed delta at the end of the straight,” he explained. “Knowing Max, I knew he would try so I predicted that he would go down the inside and he did.